Hi there! It’s Makani with Cubing.us announcing our annual competition, For the Love of Cubing 2017! 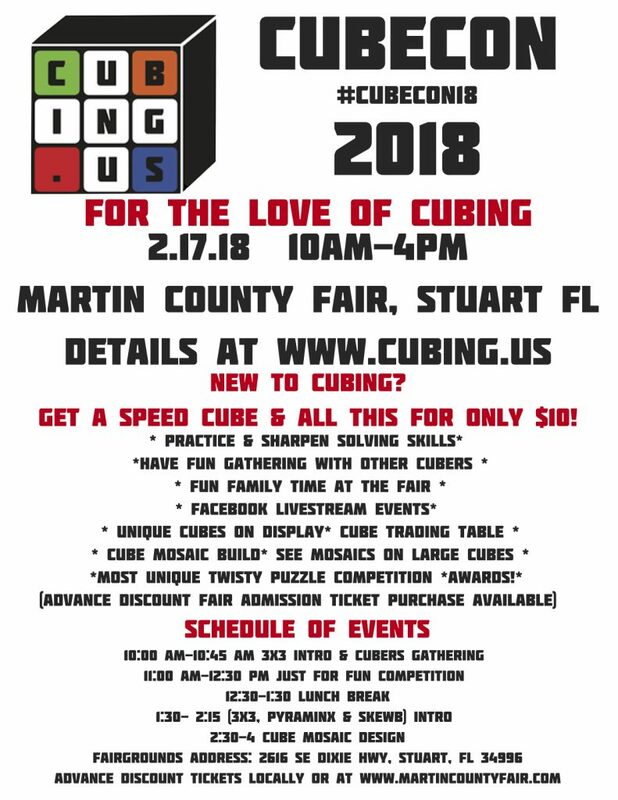 We will be selling cubes at the competition, and the booth will open after everyone has registered. You will get 2 fair tickets included with the competitior’s registration fee, but for every additional member in your party, you will have to purchase an additional ticket. You can get these tickets at a discounted rate before February 9th if you purchase them online. Act now, the shirts are only available until February 1st! That’s all from me for today, hope to see you there! Contestants receive free fair admission, and guests of competitors may purchase half-price admission tickets and discount ride bands before February 11 here. You can also purchase a competition t-shirt here. Click the link HERE to register! See you at the FAIR!